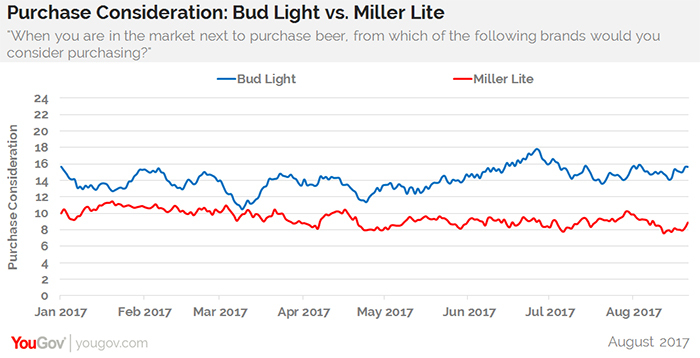 Since mid-summer, Bud Light has been pulling away from Miller Lite in two key perception metrics, with its current "craft beer antidote" campaign appearing to further strengthen its case, according to YouGov BrandIndex. In the last three weeks, even before its “craft beer overdose” spots focusing on “beer basics” began appearing, Bud Light took off in quality perception and consumer satisfaction metrics. Their new campaign was created by Wieden & Kennedy. Miller Lite, which is not currently running a campaign, declined on the two metrics over the same time frame. Miller Lite introduced its latest tagline — “Hold True” — back in March, going directly after Bud Light. That campaign sent Miller Lite on its most competitive perception run of the year so far, putting it in a virtual tie with Bud Light for about five weeks. 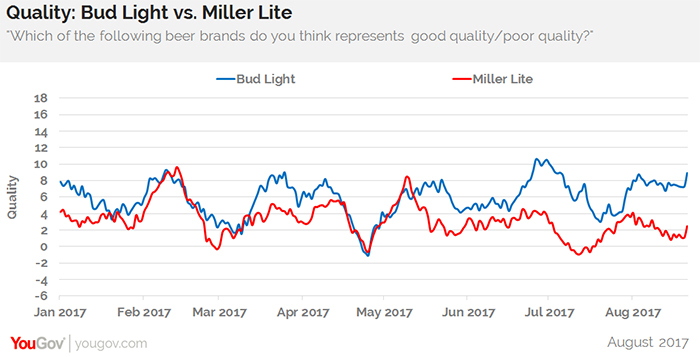 In what may be an encouraging sign for its bottom line, Bud Light has increased its purchase consideration with consumers since early May, while Miller Lite has essentially stayed flat. On May 2, 14% of adults 21 and over would have considered buying Bud Light the next time they were buying beer, compared to 8% for Miller Lite. By the end of June, Bud Light peaked at 18% before its current settling at 16%. Miller Lite is currently at 9% — a difference of seven percentage points between the two rivals. 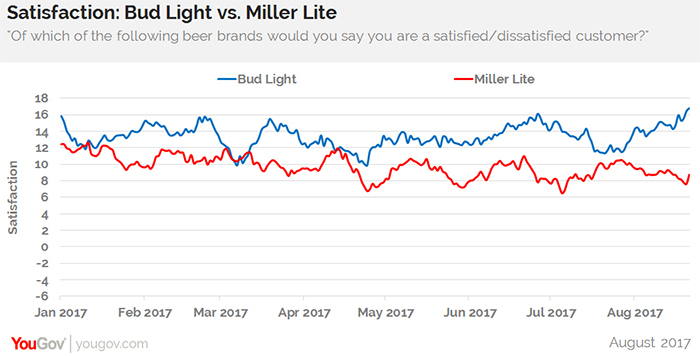 In addition to Purchase Consideration, YouGov BrandIndex measured Bud Light and Miller Lite with the following metrics: Quality ("Is it high quality or low quality?") and Satisfaction ("Are you a satisfied customer?"). For these two metrics, a score can range from -100 to 100, with a score of zero equaling a neutral position. All respondents were adults 21 and over.